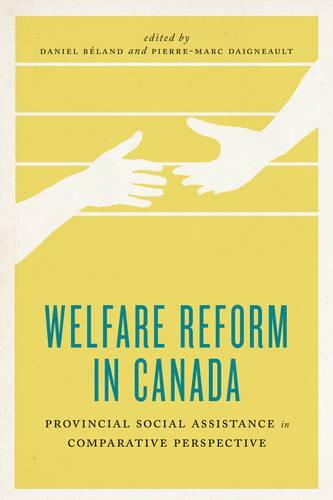 Welfare Reform in Canada provides systematic knowledge of Canadian social assistance by assessing provincial welfare regimes and emphasizing changes since the late twentieth century. The book examines activation, social investment, and economic inequalities and provides nuanced perspectives on social welfare across Canada's provinces in relation to trends and issues in the country and beyond. These conceptual, international, and historical perspectives inform in-depth case studies of social assistance reform in each province. The key issues of social assistance in Canada, including gender relations, immigrants, Aboriginal peoples, and the impact of activation programs, are addressed, as is the possibility of convergence taking place in provincial welfare policy. This book is the second volume in the Johnson-Shoyama Series on Public Policy, published by the University of Toronto Press in association with the Johnson-Shoyama Graduate School of Public Policy, an interdisciplinary centre for research, teaching, and executive training with campuses at the Universities of Regina and Saskatchewan.